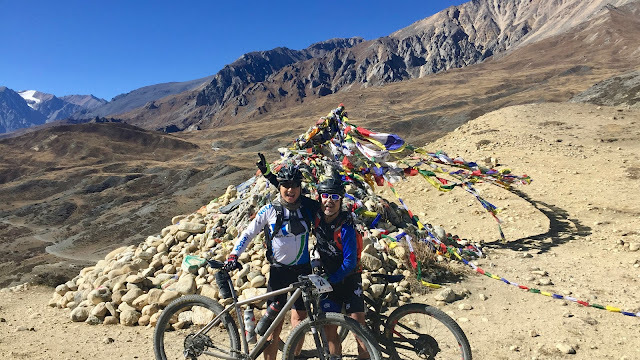 It's been a few years since my last major fundraising campaign in the TransPortugal, so what better event to race in than the Yak Attack Nepal to spread good karma and indulge in a little adventure. Cancer is a topic close to my heart. My mother and stepmother both lost their battles to brain cancer. Most recently, our housekeeper had uterus cancer but thankfully she recovered. I am also an active advocate of physical activity and exercise as being a cornerstone in preventing and treating diseases. So in partnership with Exercise is Medicine Singapore, I started a campaign to raise funds for the Singapore Cancer Society. I am delighted to announce that we have raised $32,000, thank you so much! I am truly touched by the support! The Yak Attack is the highest mountain bike race on Earth - 10 stages, 500 km and 15,000 m altitude gain. 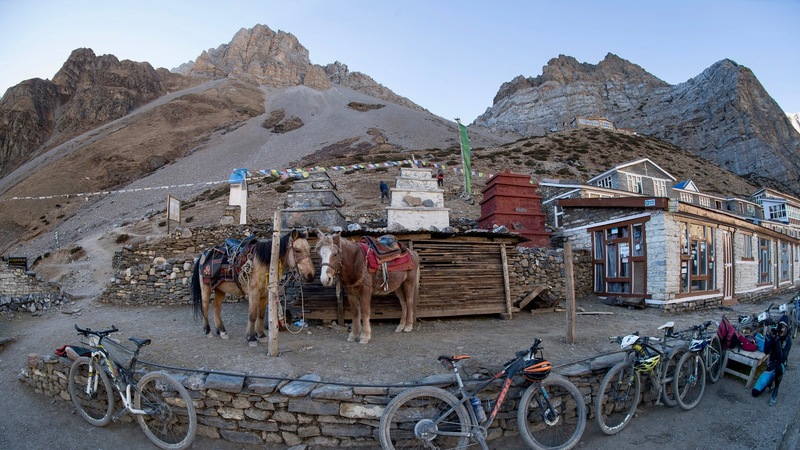 The route traverses through the Annapurna circuit and for the very first time the remote Upper Mustang region as well. 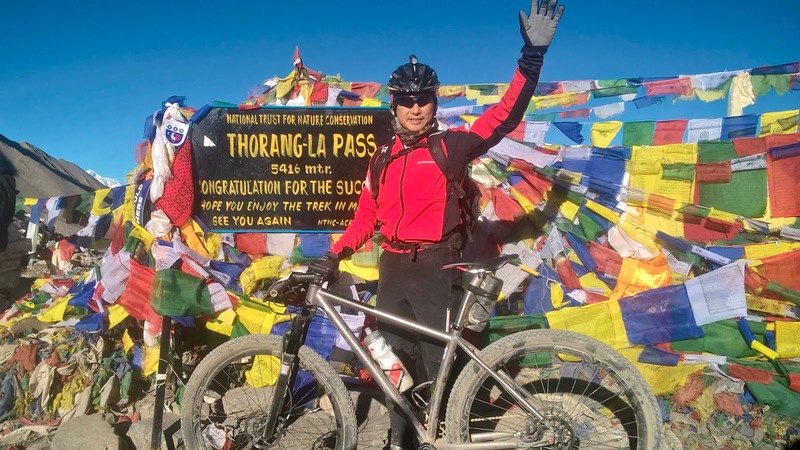 All in, there are 17 mountain passes above 3,600 m including Thorong La at 5,416 m.
Hmm, it all sounds rather epic and grand but can I do it? We shall see, but I am determined to finish the race, learn the Nepali culture and make new friends. All for a good cause. I flew into Kathmandu a couple of days before the race, no time for touristy activities but just set up the bike, rented a sleeping bag and got to know the race entourage. There's an eclectic mix of folks from around the world - mountain bike professionals, serial adventurers, even an Austrian Judo Olympian. 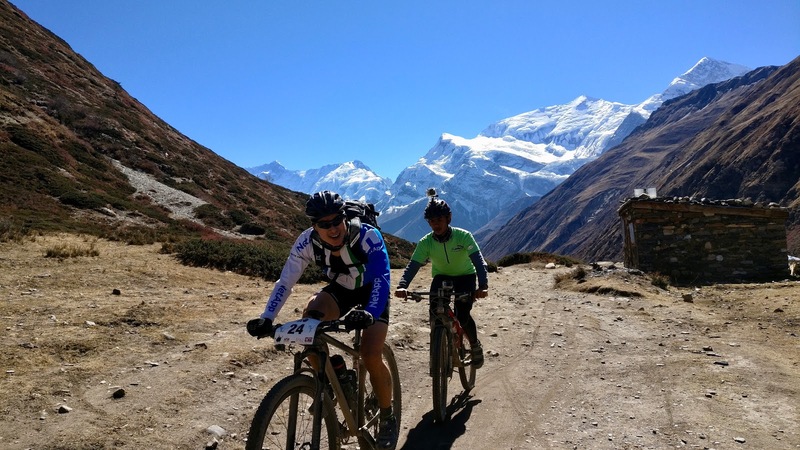 And I met some wonderfully hospitable Nepali riders, always eager to lend a helping hand. Race registration mug shot with Neil "Yak Whisperer" Cottam and the affable Race Director Phil Evans. The 175 km bus ride from Kathmandu to Besi Sahar for the race start took over 7 hours through some bumpy roads (photo Matt Rousu). BAPTISM OF FIRE - My mainly on-road training in Singapore probably didn't have the right muscles optimised for a race of this nature. 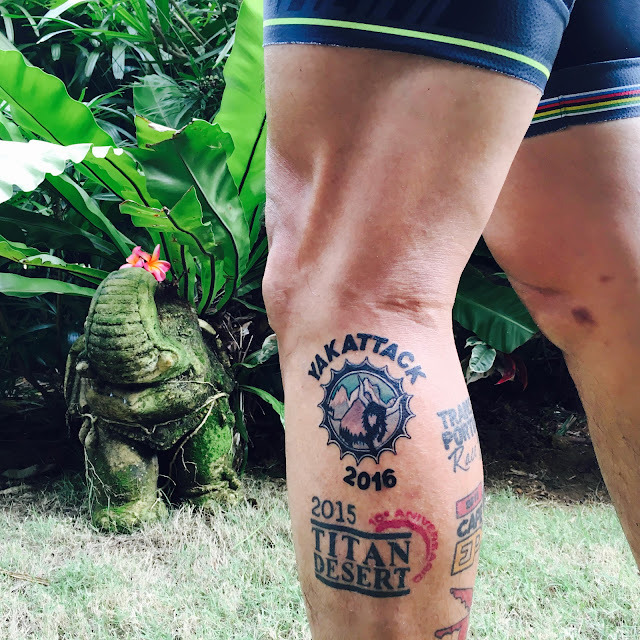 I did all of three trail rides this year, the Vietnam Victory Challenge and twice in Indonesia's Batam Drak Park. 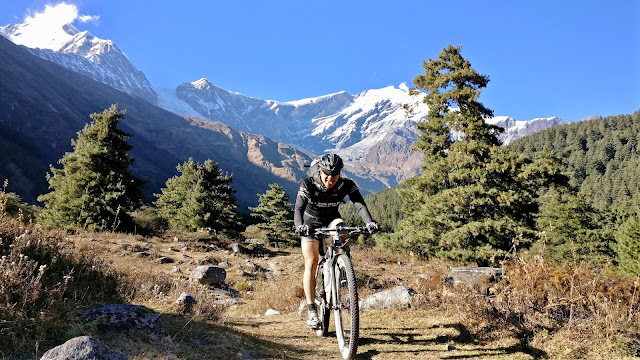 So the body and mind somewhat protested as I paced myself in today’s stage up never ending climbs, complemented with loose rocks and rough jeep tracks … Nepali climb as they call it (photo Rupert Fowler). The descents were equally tough on the body, the 29er hardtail not so forgiving. The descending part of the stage was rerouted because of a landslide. The detour cut through a steep and slippery jungle section and I hiked down most of the way. I was actually looking forward to the finish, my hands and glutes crying out for respite. On the last km, we had our first race casualty. 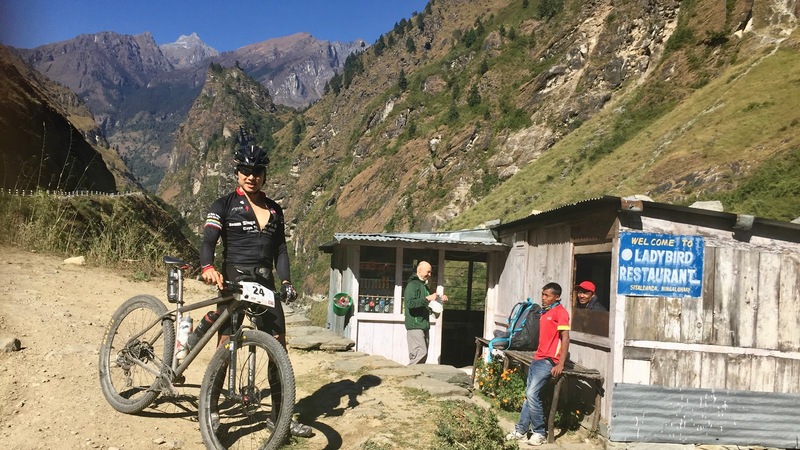 Leading Nepali rider and all-round nice guy Aayman Tamang collided with a motorbike, broke 2 ribs and had to withdraw from the Yak Attack. THE LONGEST STAGE ... OR SO I THOUGHT - A 1,000 m climb per 23 km average is already challenging, but today's route presented us with even bigger rocks and many water crossings. I started strong, but soon after slowed down considerably to pace myself. I didn't push hard. In fact, I stopped for coffee, took pictures and rested multiple times. Coffee stop - the elderly gentlemen behind me was on a 3-week hike supported by 7 crew members! 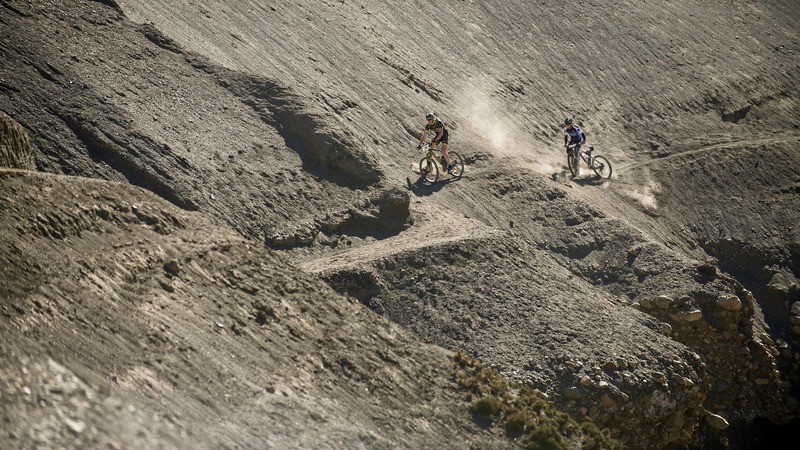 Many ascents were either too steep or rough to ride, or perhaps we were just fatigued (photo Rupert Fowler). Yes, a typical day at the office (photo Rupert Fowler). The combination of mud, water and dust took a toll on the 1 x 11 drive train, my chain squeaking most of the way. I am glad I retrofitted a 44T cassette paired with an oval 32T chainring, although the gearing is never enough on these incessant climbs. And more to come! It took me 8:50 hours to complete and the last hour was freezing. 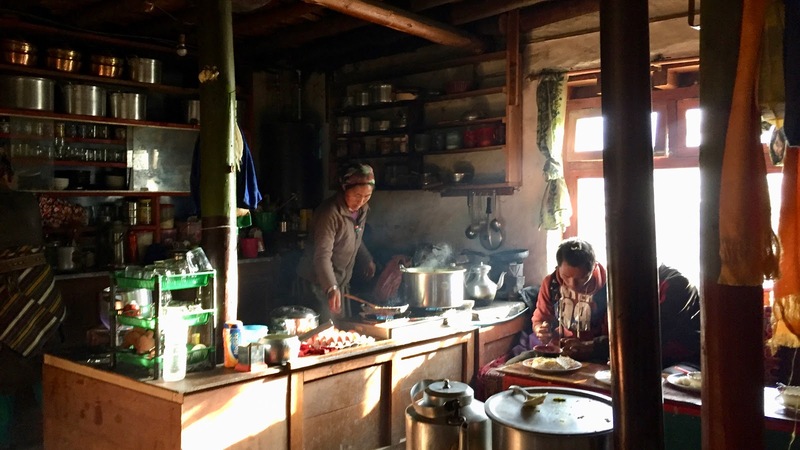 I arrived in Chame cold, hungry and had the most wonderful dal bhat, a traditional meal of steamed rice and cooked lentil soup, in a warm wood-heated cabin. THE ALTITUDE TEST - Chame doesn’t get much sunshine so it is very chilly here. I missed the tropical warmth, coming from Singapore at the equator where our four seasons are Hot, Scorching, Humid and Rainy (average temperature 30° C). Singapore's highest “mountain" is 164 m, so I climbed conservatively, wary of altitude sickness as we ascended to 3,500 m (photo Rupert Fowler). At the captain's table with Neil, Corrine, Snow Monkey, Tetsuo, Yuki, Peter, Cory the eventual Champion and Phil. We had a rest day at Manang to acclimatise to the altitude. 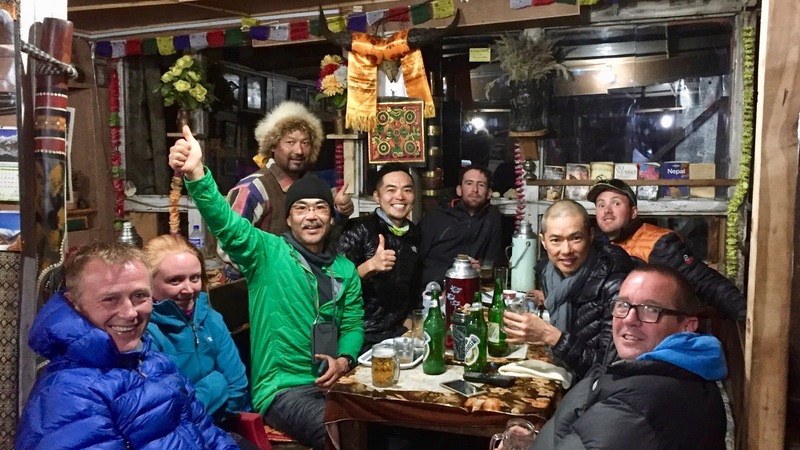 I had a lovely time - rounding up the fund-raising campaign, hiked up to a 3,800 m ridge for ginger tea, tested the Camelbak bike mount for the Thorong La Pass stage, did a short ride and concluded the rest day with beers and buckwheat bread for dinner. I felt fine at this altitude and so decided not to take Diamox and Ibuprofen. The legendary Snow Monkey of Manang (photo Tito Tomasi). 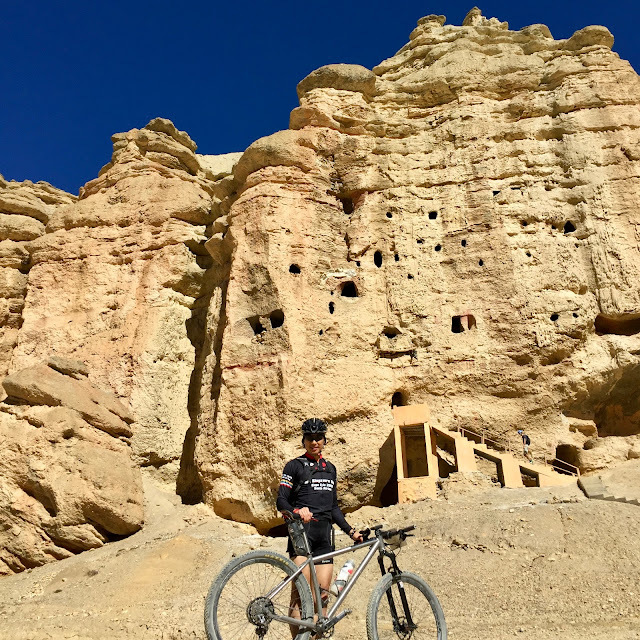 MY STRONGEST DAY - For the Upper Mustang stages, our bags were transported by porters as the trails were not accessible by jeeps. I had to off-load 5 kg to meet the 20kg bag weight limit, so out went luxuries like hand-warmers, foodstuff and baby-wipes (yes, they make life a lot more comfortable). Every morning, we dropped off our bags a few hours before the race as the porters would take a much longer time on foot to reach the next stage. Today's stage was mountain bike nirvana - beautiful snow caps, glaciers, and no motorised vehicles. 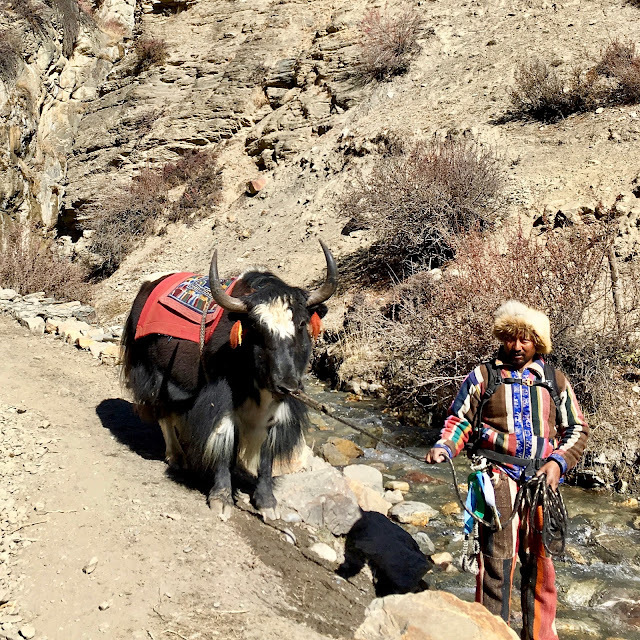 It felt like days of yore, traversing an ancient trading route as we overtook yaks, donkeys and subsequently the amazing porters that were carrying our bags. Respect! 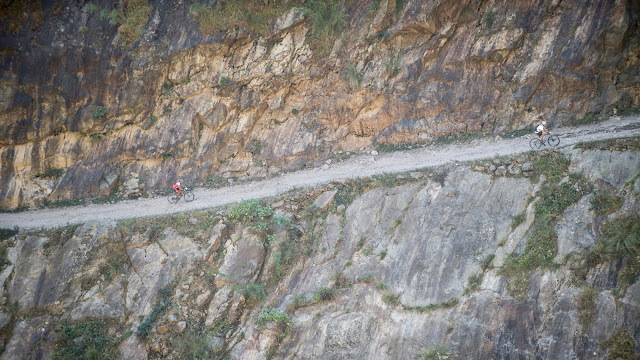 Beautiful, except for sheer cliffs and bridges that I mustered all my concentration not to look down (photo Rupert Fowler). Fast pace, chased by Bishal (photo Rajan Bhandari). Constant climbs - over 1,200 m in just 16 km to Thorong Phedi @ 4,500 m.
The accommodation here was basic, with no running water. I had to clean-up with a bucket of icy water accompanied by the wind that enhanced the sensation. 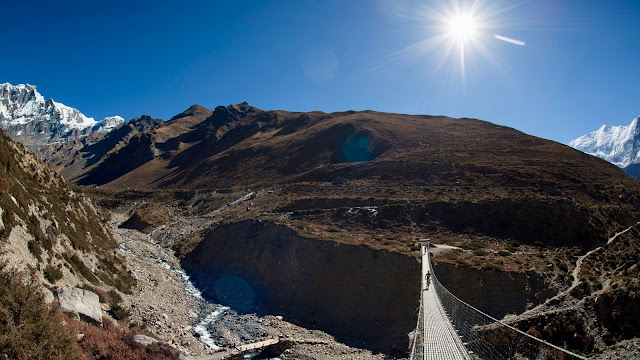 No sign of altitude sickness, although my oxygen saturation was 78% (photo Rupert Fowler). "78% saturation? Nothing to worry about," says race doctor Keith Green, "the finger oximeter is probably inaccurate". I love you Doc! THE FEARED PASS - I set the alarm at 2.35 "pm" instead of "am". 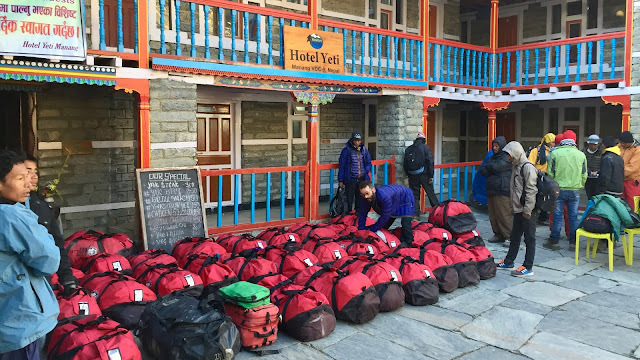 So when Tito woke me up at 2.55 am it was a mad rush to pack and drop my bag off to the porters at 3 am and then preparation for the 5 km hike up to Thorong La, the highest pass in the world. 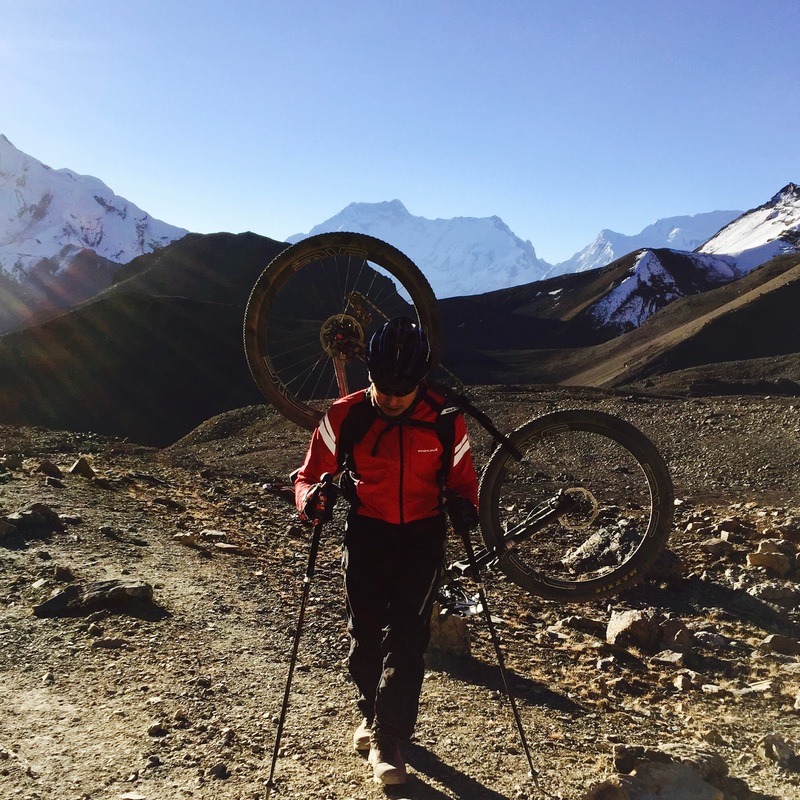 It was a surreal, slow and cold climb with the bike mounted on my back. I only settled down after an hour and began to savour the raw beauty of the vistas as dawn came up (photo Rupert Fowler). Today was the coldest stage so far, it felt like - 10° with the wind chill. My fingers were numb despite three glove layers. That said, this year's weather was already one of the mildest, with no howling winds and heavy snow like in previous years ... I cannot imagine. Hiking poles helped with stability and took some load off the knees. I was very pleased with how my knees have held up, which were missing an ACL, PCL and some meniscus from my past indiscretions. Step-by-step, breath fogging my sunglasses, I progressed. 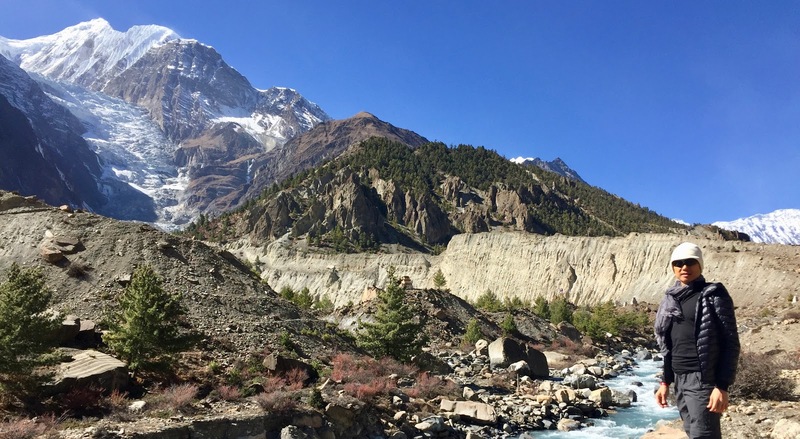 When I saw prayer flags in the distance, I knew the Pass was near and I had made it! To be here is special and a privilege. 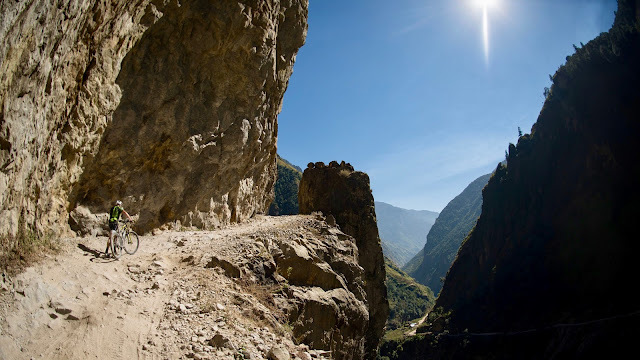 The ride down was tough as it was steep and slippery with loose rocks. Lesson learned - a dropper seat post would have been much more enjoyable. So my decision to not take Diamox was the right one. No altitude sickness even above 5,400 m. However, the thin air of around 40 % relative to sea level was impacting everyone. Even walking up the 4 stories at our hotel left me heavily breathless. 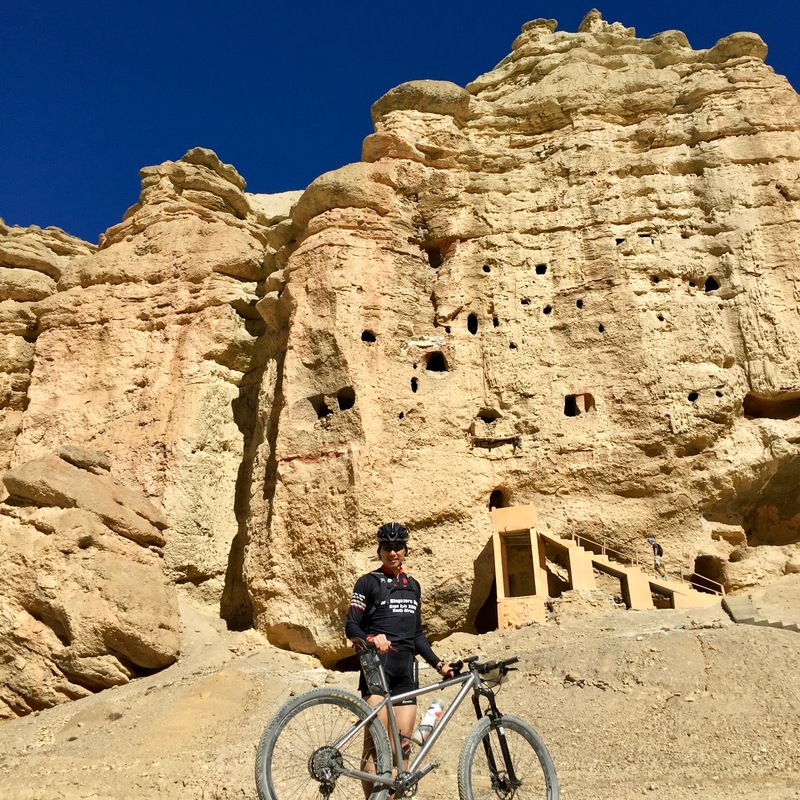 INTO THE FORBIDDEN KINGDOM - Another tough stage! The first 7 km, within view of the mighty Dhaulagiri, was mainly a hike-a-bike affair for me. Then some very challenging single track downhills with slippery rocks severely tested my skills and enjoyment again. Ahh, looks like I have lost my mountain bike technical mojo. I really needed that dropper seat post and perhaps a shorter stem. Some sections were downright hazardous (photo Rupert Fowler). But the rest of the stage were good, solid climbs. 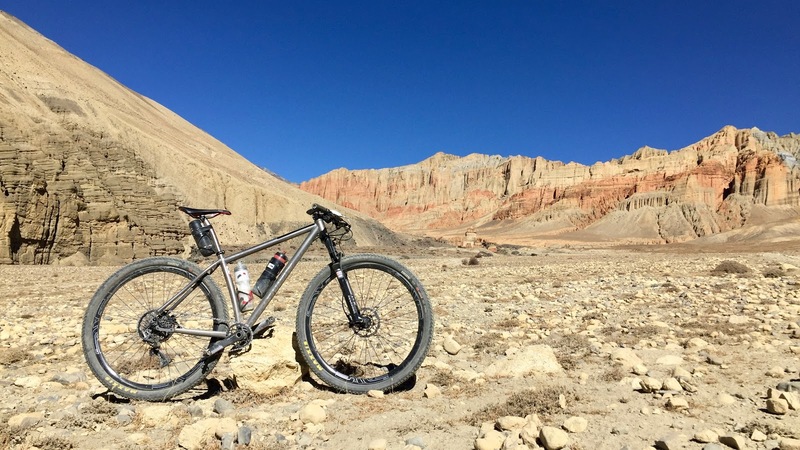 We were fortunate that the 10th edition of the Yak Attack raced through Upper Mustang. The landscape and people are quite distinct here, as we edge closer to Tibet and the Chinese border. 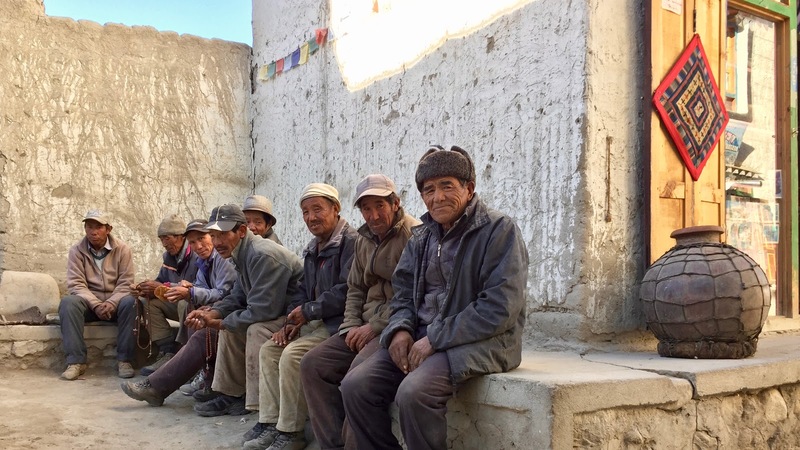 First destination - Ghiling village, powered by solar energy and no mobile or wifi coverage. The teahouse was basic, but came with a lovely surprise - gas fired warm shower! Preparing delicious dhido, a buckwheat pudding meal popular in the mountains where rice is scarce. I love the concept of eating in the kitchen which is common in Nepal. UNCOMFORTABLY COLD - So cold that my shoes were frozen solid in the morning after leaving them to dry overnight. It was another hard climbing stage today, surrounded by beautiful vistas. 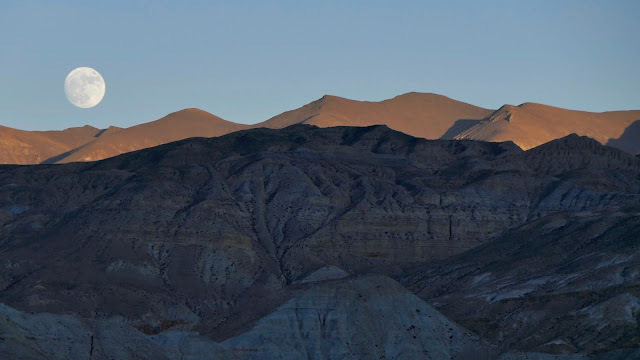 The environs of Mustang is unique, quite distinct from Annapurna. 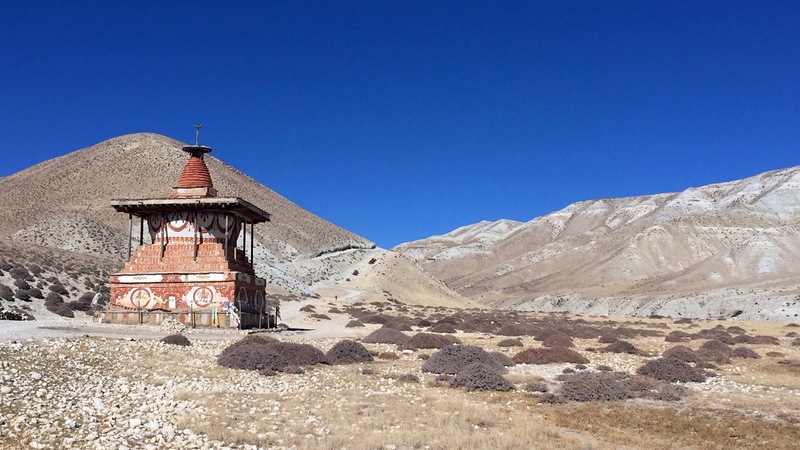 Amazing rock formations and this giant stupa in the middle of nowhere (photo Matt Rousu). 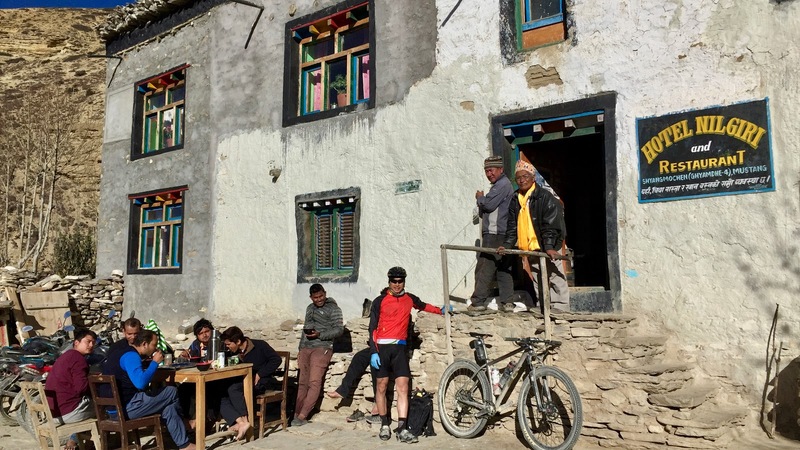 We arrived at Lo Manthang, the capital of Upper Mustang for a much needed 2 nights stay without the usual morning packing rush. This is a nice quaint town with an interesting collection of quality art, handicraft and antique shops. But still no internet or mobile connectivity, which is part of the charm. But I did stumble on an "internet cafe", albeit s-l-o-w internet service for 10 Rupees per minute and indulged in some messaging and Facebook updates. The Stage 8 Time Trial was cancelled so we had a rest day, just like these gentlemen. 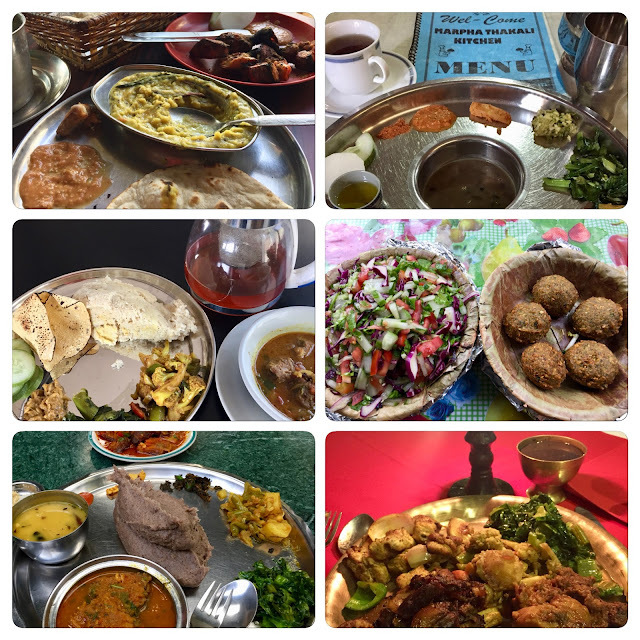 I am always hungry, so meal times are a big attraction for me. 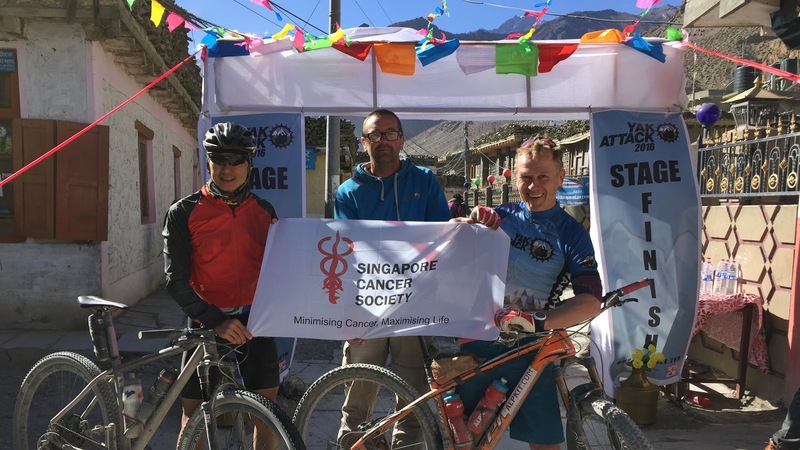 Jamyang (right) is part of the race crew who made our lives a little more comfortable. 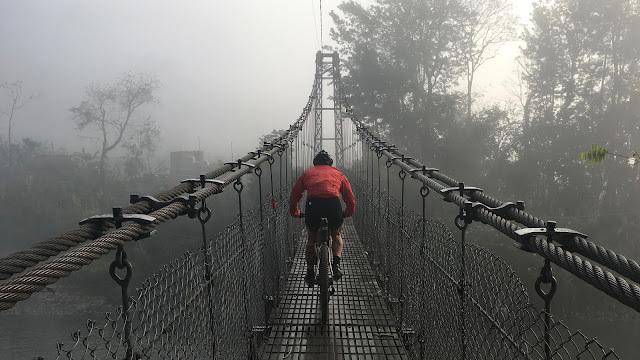 On the rest day, I joined a ride to the Sky Caves of Nepal. Unfortunately, I lost my Garmin GPS unit along with 6 yet to be downloaded files from the previous race stages. There are 10,000 caves, but no-one has discovered who built them. Some of the caves are 3,000 years old and used as burial chambers. LOST IN THE MOUNTAINS! 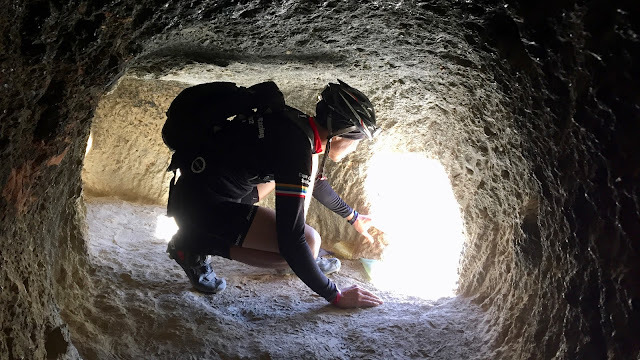 - Today was to be an incredible adventure, having to ride without my Garmin GPS and relying solely on the course markings which sometimes were easy to miss. 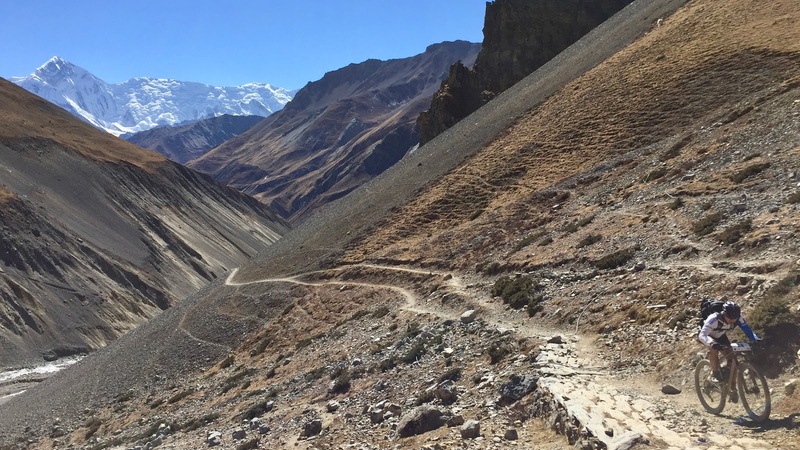 The climb to the highest pass in Upper Mustang, Chogo La @ 4,288 m with Tetsuo was exhilarating. After the pass, the trails dispersed as we approached a flatter and expansive area. The markings were visible for a while, and I also followed the tyre prints left by the race leaders. However, I soon realised that the tyre prints were gone and much as I tried to retrace my route, I just couldn't find any markings. 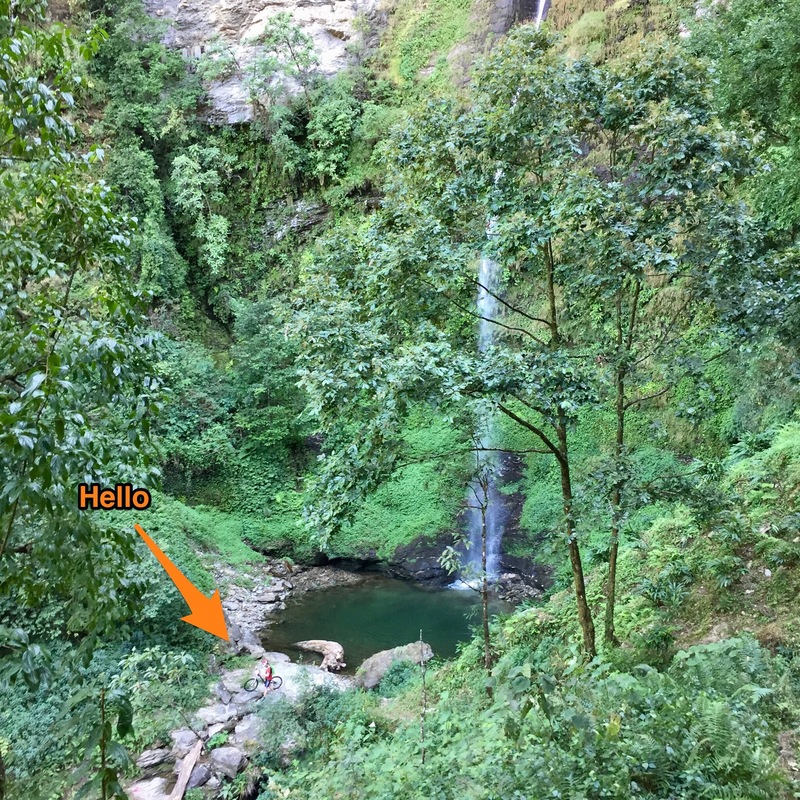 Two frustrating hours and three futile attempts to communicate with the locals later, I met a young farmer who spoke English. 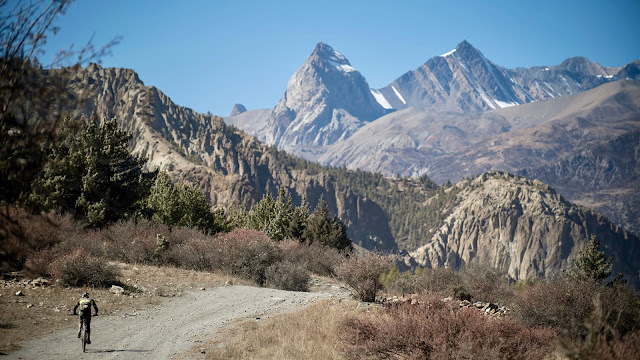 He had seen some riders earlier and pointed me in the general direction - across a deep gully and up the side of a mountain to a jeep trail. After hiking down and bashing through shrubs, I was back on track. There's hope! But I got confused as some markings were pointing to the opposite direction. Those were from the earlier stage, but my fault, I should have known better that we were riding backwards on essentially a similar trail. To compound the misery, some sections had strong winds and gusts that might have blown away the tyre prints. That cast some doubts and made me turn around to double check the markings. I spent the last daylight hour desperately chasing after the setting sun, but of course, it was in vain (photo Matt Rousu). So after over 8 hours on the saddle, the sun set and rapidly became dark. But right on cue, like a TV drama, I reached Shyangmochen village. This turned out to be the last inhabited place before Chele. 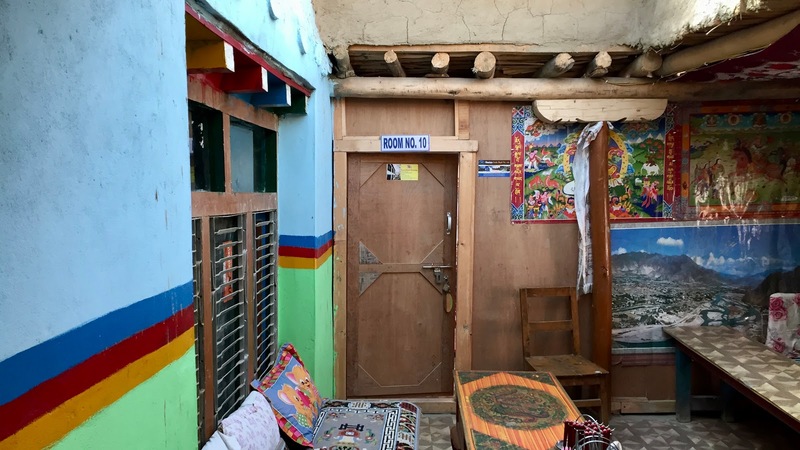 I walked into a guesthouse and met some motorbike tourists from Kathmandu who spoke English, and they advised that I stay the night as the destination is still far. I telephoned the organisers and race doctor from a land line but alas, there was no mobile signal. Luckily the guesthouse owner knew the race hotel in Chele and managed to call and get me connected to Phil and Neil. The first thing I uttered to Phil was "please don't come and pick me up, I would like to finish the Yak Attack"... well, not that they could anyway as the roads get icy and slippery at night. It would have been dangerous to do so on a 4-wheel drive. Phil agreed for me to spend the night and continue the next day. Relieved, all of us at the tea house had sumptuous dhido with dal and curry chicken, enhanced with beer, home brew wine and lovely hospitality. 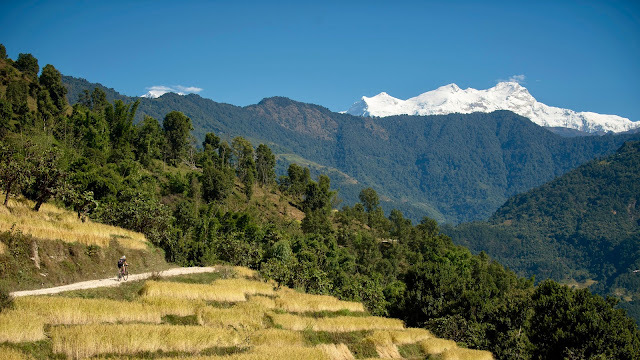 I went to bed early and strangely, had the longest and deepest sleep in Nepal here - 10 solid hours. 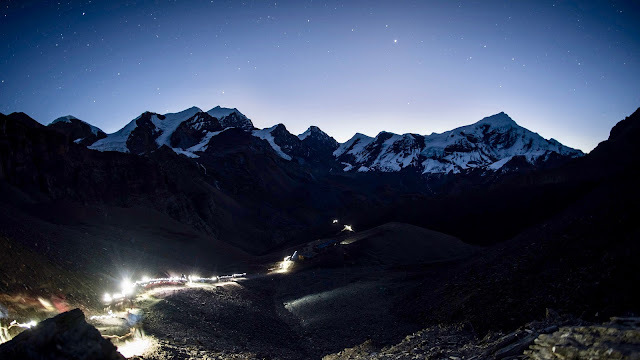 THE FINALE - I have the remarkable honour of being the only racer in Yak Attack history to be stranded overnight and thus clocking the longest stage timing. On reflection, I only had a space blanket and no food left - I cannot imagine the scenario if I had not passed Shyangmochen exactly at dusk ... I believe someone was watching over me. Namaste. And I wouldn't have changed the script for the world! 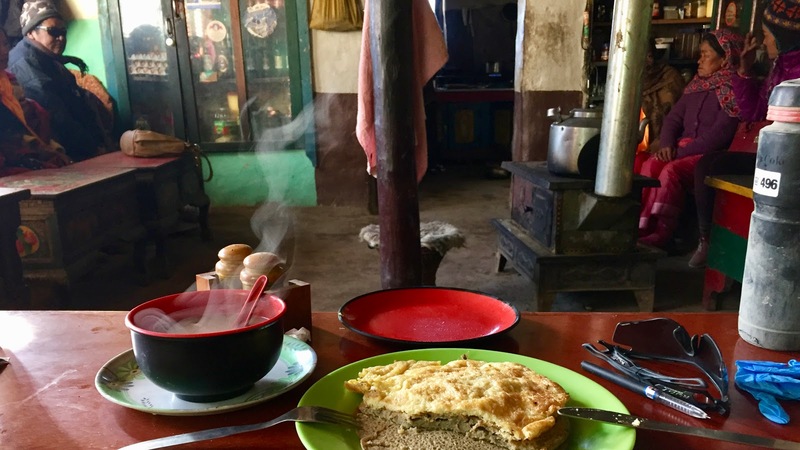 In the morning, I had a hearty breakfast of garlic soup (good for altitude), omelette and buckwheat pancake. 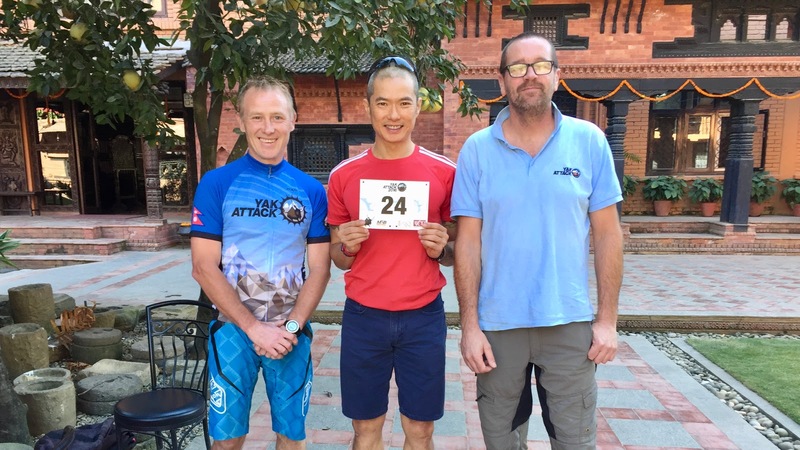 I am eternally grateful to the Kathmandu motorbikers (left) and guesthouse owner (top of steps). 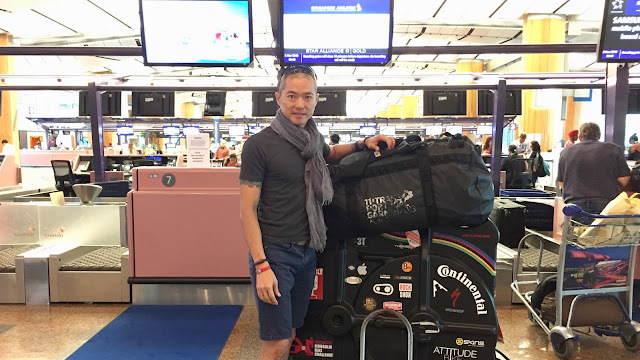 After the goodbyes, I was on my way to join the starting line for the final stage. I rode for nearly 2 hours before arriving at Chele, so the decision to stay overnight was brilliant. The race entourage had just left when I arrived, but Neil waited for me and we had a windy but superb ride to the finish line. I was ecstatic to see the rest of the folks in Jomson, I think many of them felt the same too. 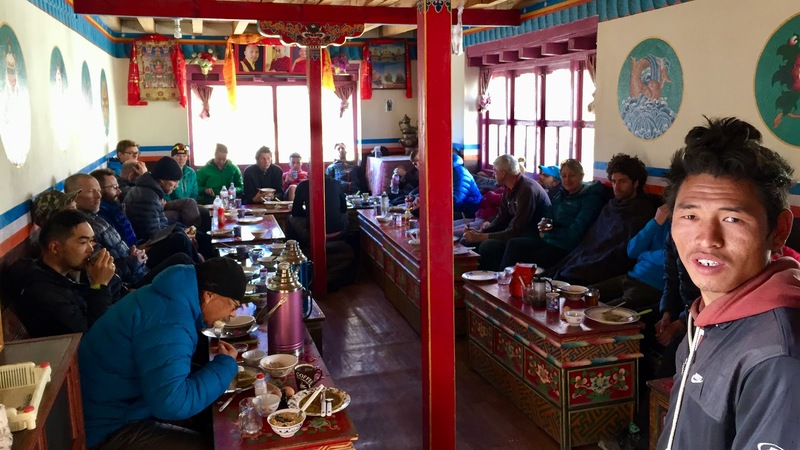 Post-race, the mood was a lot more relaxed as we indulged in free-flowing drinks and food, reflecting on our personal trials and tribulations of the past fortnight ... overcoming the odds and rewarded with memories for life. The next day, most folks took a chartered flight to Kathmandu whilst a group of us rode to Tatopani hot springs for the night, then to Pokhara to end a 2-week mountain bike odyssey. Ride leader Ajay Pandit and his merry men (photo Rajan Bhandari). To my horror, the seasoned riders decided that this would be a bike packing trip, so only essentials were squeezed into the backpack. But it was an excellent test of frugality and resourcefulness, as it turned out (photo Rajan Bhandari). Pokhara is an ideal town to rest and recuperate. It has a calming aura about it and everything is within walking distance along the Lakeside vicinity. I liked it so much that I extended my stay to a week, just being a bum, practised yoga and indulging in the local cuisine. I absolutely love Nepali cuisine, my favourite being buckwheat bread and dhido. Actually, I love them all! Then I flew to Kathmandu and stayed in the bustling and colourful Thamel area, riding with Neil and friends and continuing my eating and drinking fest. By now I have run out cash as I had not planned to stay this long in Nepal, and many establishments don't accept credit cards. It was an adventure in itself, hunting for ATMs, communicating with my bank and finally an ATM that worked with my card. 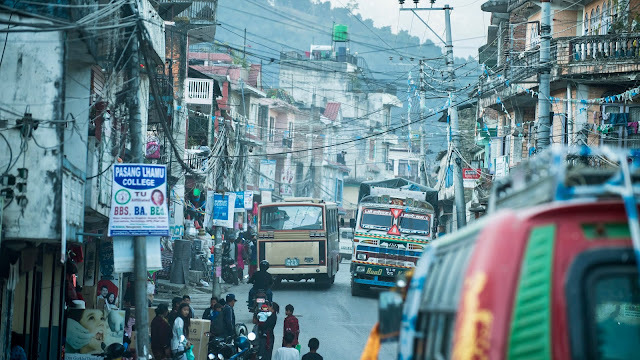 After a month in Nepal, it was time to go home. I have had an epic and incredible journey, made only possible by the amazing folks in my life and friends I made along the way. A sincere appreciation and dhanyabad - to all the donors who generously supported the Singapore Cancer Society, Phil and Neil from the organising team, the crew from Yeti Travels, Rajan and his mechanics for keeping my bike happy, Corrine for the much needed massages, Dr Keith who tended to the open sores on my feet, fellow racers who kept me honest and relegated me to the back-markers, Tito my free-spirited roommate, the gracious Nepali folks who made us feel at home, Rupert and Matt for the stunning photos, Himalayan Singletrack staff, Attitude Bikes Singapore for preparing my bike, and my Singapore riding brothers and sisters. And of course, it is all only possible with my lovely girls Sophia and May Shann’s unconditional support. One more badge to the collection. It was really informative to know about the bike races as I’ve no clue about them and it was really a good humanity to show that you guys raised a nice amount of donation. I like your suggestions. thank you for sharing. Hope you can contribute more quality posts to this page.